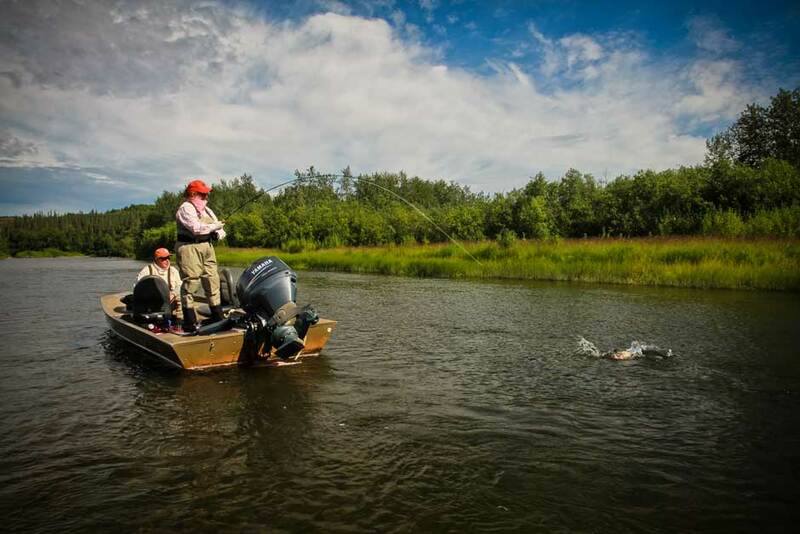 Unalakleet River Lodge, Alaska | Tailwaters Fly Fishing Co. Guests travel to Anchorage Saturday, where they spend the night and then take a regularly scheduled Sunday flight to Unalakleet with Pen Air. The following Saturday, guests travel back to Anchorage with Pen Air in time to make commercial connections onward to the lower 48. Jet-boat based program accessing miles and miles of easy to wade, pea gravel riverbed. Swinging wet flies is most consistent, but there are many times when wog style floating patterns can be deadly on Silvers especially. Light tackle fishing with 3-5 weights targeting grayling on dry flies is another typical component to every week. Choosing a date to fish on the Unalakleet should be determined by which species of fish you would like to most heavily target. Fishing in general is excellent any time in the season but the conditions and species available vary from month to month and may impact when you decide to visit. Note that dry fly friendly grayling and dolly varden are abundant ALL season. (See WHEN TO GO for Details). Is Unalakleet River Lodge Right For You? URL is perfect for children, rookies, and hard-core experienced anglers alike. The low gradient, slow flowing, pea-gravel riverbed of the Unalakleet and its tributaries make for consistently easy wading. You could not design an easier venue for anglers of all skill and physical fitness levels to enjoy incredible success fishing. The fly fishing style and techniques are not technical, and many guests at the lodge prefer to use spinning gear as well. Rainbow trout are not found in the river system; however, fifty to one hundred fish days comprised of salmon and other species are not uncommon on the Unalakleet! If you are looking for an affordable Alaskan wilderness experience where there is a bend in your rod all day — look no further than Unalakleet River Lodge. The Unalakleet River is one of Alaska’s best kept secrets. It is the lodge you go to when you simply want to indiscriminately catch A LOT of big fish. 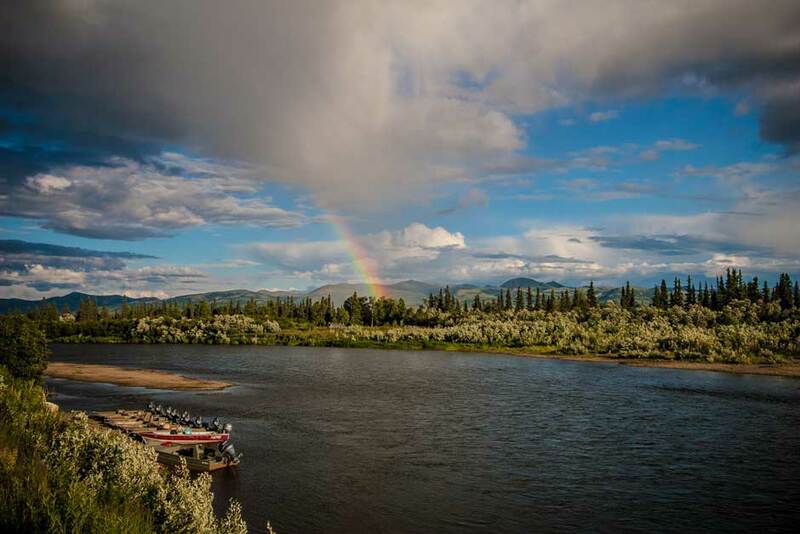 It is the perfect venue for anglers seeking a remote lodge as well as constant and productive fishing for salmon, dolly varden, arctic char, and grayling. If you are looking for an affordable Alaskan wilderness experience where there is a bend in your rod all day — look no further than Unalakleet River Lodge. 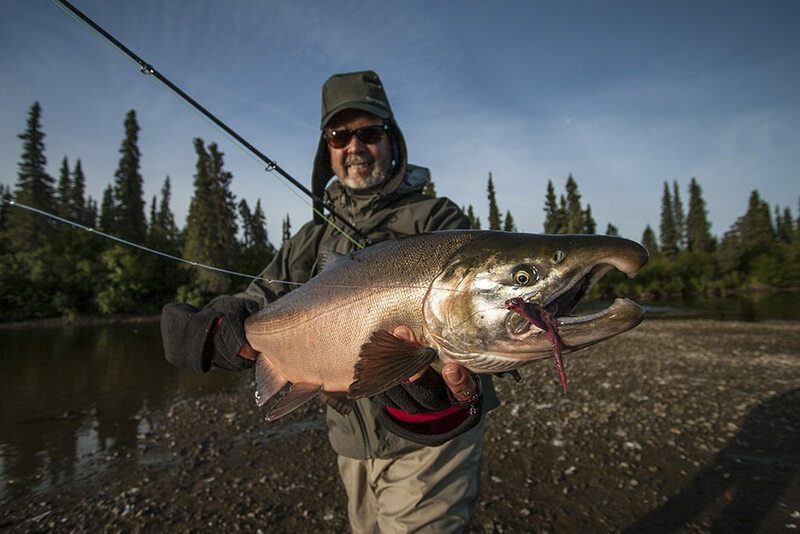 The Unalakleet boasts one of the most prolific silver (coho) and pink (humpy) runs in Alaska. Pinks make for great fun on a five or six weight, and are perfect for beginners or smaller children. During the peak season for silvers, catching 40-80 fish a day in the 7-12 pound range is common. Chum salmon are around a good part of the season in prolific numbers, and the early season Chinook fishing is very reliable. 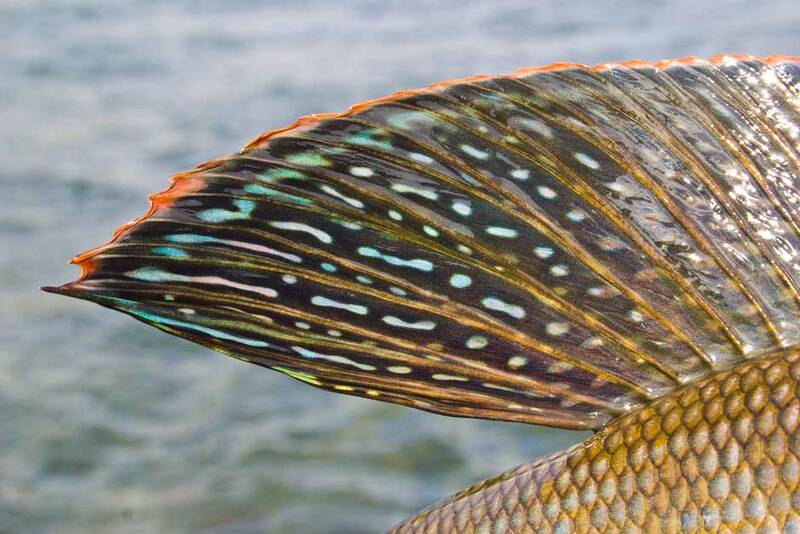 Add grayling on large dry flies, colorful char and sea run dollies to the mix, and anglers enjoy a week with continuous fishing success. The village of Unalakleet is located 400 miles northwest of Anchorage in a very remote corner of Alaska… almost a world away from the hectic and often crowded fly-out fisheries to the south. Unalakleet River Lodge is the only operation on the entire river system, with over ninety miles of spring creek-like river and multiple gin clear tributaries — providing a level of exclusivity and privacy that is very rare in Alaska these days. The small fishing village of Unalakleet is located approximately four hundred miles northwest of Anchorage on Norton Sound. The lodge is situated on a beautiful bluff overlooking the river about ten miles from the Bering Sea. Owners and operators, Sally and Jeff Appel, run a service oriented lodge with a very warm family-like and extremely laid-back atmosphere. It is the only operation on the entire river, with over ninety miles of spring creek-like river and multiple gin clear tributaries. The Unalakleet River is one of Alaska’s best kept secrets. It is the perfect venue for anglers seeking constant and productive fishing for salmon, dolly varden, arctic char, and grayling. If you are looking for an affordable Alaskan wilderness experience where there is a bend in your rod all day — look no further than Unalakleet River Lodge. With easy wading and non-technical fishing conditions, Unalakleet is an ideal destination for anglers of all skill levels. Rainbow trout are not found in the river system; however, fifty to one hundred fish days comprised of salmon and other species are not uncommon on the Unalakleet! One of Tailwaters’ employees, Matt Jones, was the head guide at Unalakleet River Lodge for the 2006-2009 seasons. 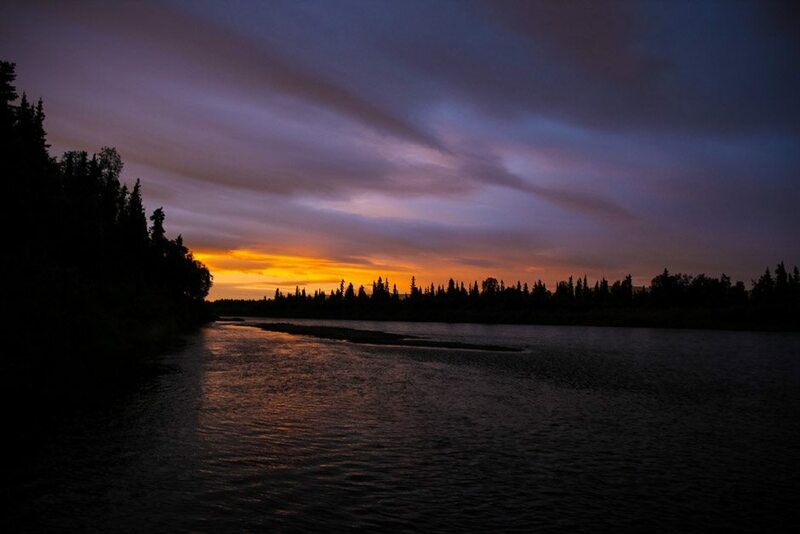 Although there are many tributaries that feed into the Unalakleet, anglers will most often fish the Unalakleet and a main tributary, the North River. The lower section of the river is typically fished by either drifting or anchoring up on pods of salmon. Wade fishing is most popular when the Unalakleet is at its lower water levels, giving way to numerous gravel banks loaded with all five species of salmon, char, and grayling. The North River is the clearest of the tributaries and offers both incredible wade fishing and sight fishing for all species. The lodge operates comfortable, sixteen foot, aluminum boats equipped with forty horsepower jet propelled outboard motors and comfortable swivel seats. The river has many spring creek characteristics (slow current, pea gravel bottom), making it a very user friendly river for anglers of all ages and physical ability. Boat runs are anywhere from five to forty-five minutes depending on the time of season, conditions, and species targeted. The Unalakleet boasts one of the most prolific silver (coho) and pink (humpy) runs in Alaska. It was estimated that the pink salmon run in 2009 was over 4 million fish in one system. Pinks make for great fun on a five or six weight, and are perfect for beginners or children to get the hang of it. During the peak season for silvers, catching 40-80 fish a day in the 7-12 pound range is a common occurrence. Chum salmon are of course around a good part of the season in prolific numbers as well. Nearly all of the fishing is done sight casting to huge pods of staging fish, and the surface / dry fly fishing with “wog” style patterns can be incredible. 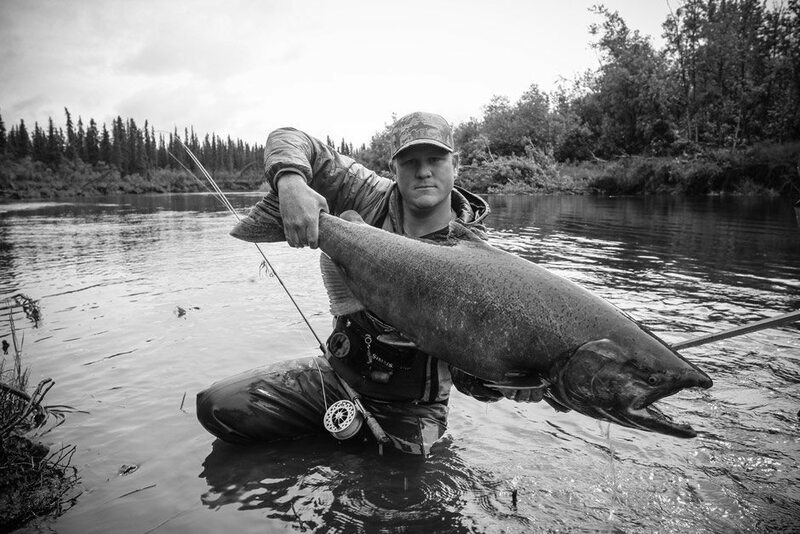 The guides at URL have begun “dialing in” the early season king salmon on the fly as well. There are few places where anglers have opportunity to swing flies in shallow, clear water to staging kings in the 10-30 pound range as found at Unalakleet. Arctic char and grayling are also part of the daily program at URL. Both species are readily taken on traditional salmon flies/streamers or egg patterns, and grayling exceeding twenty inches are often encountered aggressively sipping large dry flies such as caddis and mayflies. Guests are welcome and encouraged to use spinning gear if not interested in fly fishing. However, the guides at URL are great instructors, and with zillions of eager salmon, char and grayling right before your eyes, there is simply no better venue to learn how to fly fish! Accommodations at Unalakleet are surprisingly sophisticated and polished considering the remoteness of the operation. The main lodge consists of the dining room, bar, small fly shop, several lounging areas and outside deck overlooking the river. This building serves as the social gathering place for the lodge, while guests stay in separate guest quarters along the river. 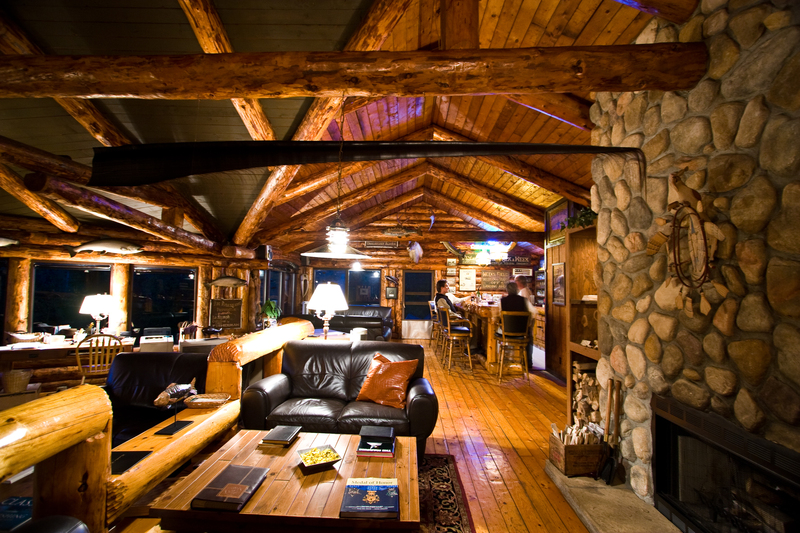 All structures are constructed in traditional log cabin style, are tastefully decorated, and have all the charm and warmth you would expect from an Alaskan fishing camp. Unalakleet River Lodge will accommodate a maximum of fourteen – sixteen guests in eight individual double or triple occupancy cabins. Each cabin is equipped with a private bath, electric heaters, with comfortable beds. Some cabins have twin beds while others are set up with queen beds to accommodate couples. The lodge employs a professional chef that turns out incredible meals ranging from fresh salmon, crab claws, poultry, wild game, steak, plenty of fresh fruits, vegetables, and delicious desserts — definitely one of the highlights of the URL experience. Guests have the option of a proper shore lunch, packed sandwiches, or returning to the lodge for a hot meal. The lodge bar is always well stocked with numerous spirits, wine, and beer. Unalakleet River Lodge operates on a 6 Night / 5 day Sunday – Saturday weekly schedule. The first leg of the trip to Unalakleet River Lodge is accomplished by traveling to Anchorage, Alaska, on the Saturday prior to the Sunday arrival at lodge. Note there are daily non-stop flights to Anchorage from many cities including Dallas, Houston, Los Angeles, Seattle, Atlanta, New York, Denver and others. Guests overnight in Anchorage at one of our recommended hotels on Saturday night. On Sunday, guests travel from Anchorage to Unalakleet (90 minutes) with RAVN Alaska. Upon arrival in Unalakleet, guests are then met by the guide staff and transported upriver approximately fifteen minutes to the lodge. There is no guided fishing on the day of arrival. Travel to Anchorage, Alaska. Stay overnight in recommended hotel such as the Millennium Hotel five minutes from the airport. Travel to Unalakleet with RAVN Alaska (approximately 90 minutes) and 15 minute boat ride up river to the lodge. Once at the lodge, you will have time to unpack and get oriented before getting your fishing license. Before dinner, you will meet your guide and get outfitted with the necessary gear for the week. Fishing days. Days kick off with breakfast served from 7:00-8:00AM. After breakfast, anglers grab gear and meet their guides at the dock. Guides navigate the rivers with jet boats. You have the option to fish out of the boat or to wade fish, depending on the species. Lunch is normally taken in the field, however anglers may return to the lodge for a hot meal if desired. 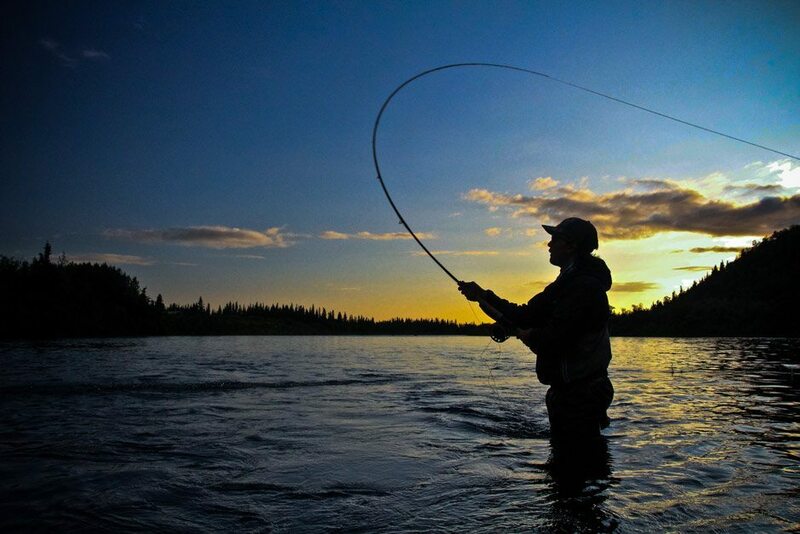 Anglers typically return to the lodge between 5:00PM-6:30PM. Cocktails and appetizers are served before dinner, which is typically scheduled for 7:30PM. Departure day. Anglers enjoy another solid 4-5 hours of fishing on departure day before starting the process of traveling home. Guests follow a similar procedure returning to Anchorage with RAVN and connecting onward. There are numerous overnight “red-eye” flights departing Anchorage Saturday night and arriving home the following morning. Unalakleet River Lodge is open from early June through mid-September. Choosing a date to fish on the Unalakleet depends upon which species of fish you would like to most heavily target. Fishing in general is excellent any time in the season but the conditions and species available vary from month to month and may impact when you decide to visit. Note that dry fly friendly grayling and dolly varden are abundant ALL season. The month of June is marked by the arrival of the mighty Chinook (king salmon). This is a great time to troll for kings with conventional gear, and try a hand at swinging some flies for these giants as well. 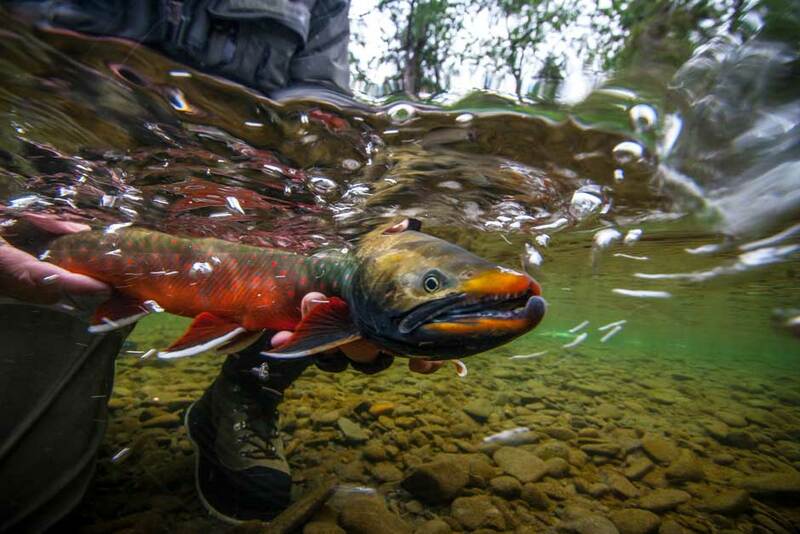 Although king salmon will hang around for the first few weeks in July, the last two weeks of June are prime time. Chums and zillions of pinks also begin arriving in great numbers toward the end of the month. July is a month noted for its huge variety of options including the peak of the chum runs as well as the addition of the pink salmon — and the beginning of the silver run. Throw in the longest days of the season, mild weather, the dollies, char and grayling — and you have one of the best all around months fishing the Unalakleet. Hard fighting chums are still around through August, however this is predominantly the month of the Coho (silver salmon), which is the most acrobatic and eager of the five pacific salmon species. The silvers continue to pour into the river system until the lodge closes in mid September. Again, Arctic char, dolly varden, and grayling are available all season long. The weather is about the only thing you CANNOT count on with your trip to Alaska. Guests must plan on every type of weather to occur at anytime. Daytime temperatures range from cool to hot and rain showers can occur at any moment. On any given day you could see hot weather turn to cold, calm turn to windy, and sunny to rainy almost before your eyes. If you decide to visit Alaska, high quality rain gear is an absolute must. Typically, June and July are a little warmer and drier than August and September. Fishing is the predominant activity at URL, however non-angling guests are welcome to visit the lodge. There are no organized non-angling activities at the lodge, however on occasion non-anglers will join fishing companions to enjoy the solitude of the vast wilderness surrounding the lodge. On occasion, you will see a grizzly bear or a moose, however both are heavily hunted in the area and are very leery of humans. Bald eagles, ospreys, peregrine falcons, owls, and foxes are encountered regularly. 6 Nights double occupancy accommodations at Unalakleet River Lodge; 5 Days guided fishing with shared guide; Daily housekeeping and midweek laundry service; Three meals per day; All transfers between the Unalakleet Airport and Lodge; Preparation of all harvested fish. A non-refundable fifty-percent (50%) deposit is required at the time of booking to confirm all reservations. All trips must be paid in full 60 days prior to departure day. All trips booked within 60 days from departure must be paid in full. Refunds are not granted for non-fishing days due to weather or reasons out of the lodge’s control. A deposit may be transferred to another person who is not booked at the lodge for the current season. Any cancellation made 90 days or more from departure are subject to a $250 per person cancellation charge. Cancellations made within 90 days from departure are subject to a 50% refund. Cancellations are NON-REFUNDABLE if made within 30 days from scheduled trip dates. Refunds of deposits/payments made on credit cards will be charged a 3.5% service charge to fully compensate Tailwaters Travel for all bank charges incurred. Receipt of deposit and/or final payment is acknowledgment that registrant has read and accepts the cancellation, refund and responsibility clauses.